The overlap column shows how many SNPs the kits being compared have in common. It is color coded to indicate whether there are enough of them for it to be a good comparison; the redder it is, the worse it is. Kit – The kit number of your match. Click it to see their one-to-many matches. Kit numbers that start with two letters have been uploaded directly to GENESIS and one letter kits are the ones migrated from GEDmatch. A checkbox column is there for Tier 1 members only – you can check a number of kits and then look at them with the Multi Kit Analysis (MKA) tools by clicking the visualize button at the top of the page. 1:1 – This column has an underlined A which you can click to do a one-to-one comparison. Name – This might be an alias or a real name. It’s whatever the user chose to use. Email – Cut and paste this to send an email to the person who uploaded that kit. Be sure to include the kit number in the message to your relative. Largest Seg – Close relatives will always share large segments. If this is less than about 12 the match may be too far back to find. Total cM – This is the most important piece of information in the report. It is the total in centimorgans of the matching half identical segments that you share with your match. Look up that number at the online calculator here: https://dnapainter.com/tools/sharedcmv4 – a word of warning if this is the same number as Largest Seg then you have a single segment match which can be anything from a 4th to a 14th cousin. Work on other matches first! Gen – This is Genesis’s guesstimate of the distance in generations between you and your match. A parent or child will be 1 and an aunt/uncle/niece/nephew will be 1.5 while a first cousin is expected to be a 2. A good rule of thumb is to subtract one to get the approximate cousin level. Less accurate than the calculator above, but a good approximation. Date Compared – This is the date that the overlap was calculated. If you are looking at a the one-to-many for a migrated kit some of these will have N/A. Testing Company – This is the company which did the DNA test. If it is a kit migrated over from GEDmatch it will say something like “Migration – F2 – A” where the final letter indicates the company: A for Ancestry, M for 23andme, T for ftDNA, and H for MyHeritage. Only the M kits will show different chip versions like V3 or V4. By the way, you can use the User Lookup on the top right of your home page to check if your match has uploaded a tree with a GEDcom. Use the email address in the lookup as the person may have multiple kits not all of which are attached to their tree. Trees are currently shown and linked to only from the Tier 1 version of the one-to-many tool. There are also tools to help interpret your results like the “Are Your Parents Related” tool (click here for that blog post) and the “People who match both, or 1 of 2 kits” which gives you the matches you have in common with (ICW) another kit. That can help narrow down which family line your new cousin belongs to. More about those in part 2 to come soon. Should I upload again to GENESIS or just use the migrated kit? The new template is slightly different so you will get better results if you upload again. Up to you. I have two kits for the same person now, should I delete one? 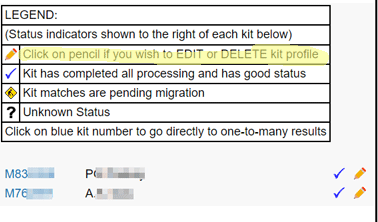 It is better to mark the migrated kit as Research; that way any cousin who made a note of that kit number won’t be surprised when they try a one-to-one. Why are the columns not sortable? And where is the wikitree or gedcom link? Currently those features are only available in the Tier 1 version of the one-to-many, so treat yourself to a month or two of a Tier 1 membership. It’s not free for them to run this site, so you can feel good about contributing. But see the update below! GEDmatch tools 2016 – covers the Tier 1 one to many columns headings and some of the other tools. This post was getting to be far too long, so I will put the rest in part II, after my presentation this coming Saturday. UPDATE 12 Feb 2019: Try the new Beta one-to-many. It has sortable and searchable columns and links to trees. No sooner had I finished this post than that started to work for free users! So part 2 may be sooner including that and part 3 next week. Disclaimer: I occasionally do paid programming work for GEDmatch and have a complimentary Tier 1 membership in return for which I give some support help. I often blog about the site because I am definitely a heavy user of their tools. I was asked to write this GENESIS basics blog and they also offered to pay me to do a video… we will see 🙂 i4GG will have a video of my GENESIS talk at the last conference soon. ← Are you genetically resistant to AIDS? What happened to the chromo browser? How to access? You can get to the chromosome browsers and many other tools from the Multi Kit Analysis which is a Tier 1 function OR from the new beta one to many by using the check boxes. This will be covered in part 2 of this series. Is there a place to leave yourself notes about a match in WikiTree? If so, where is it? 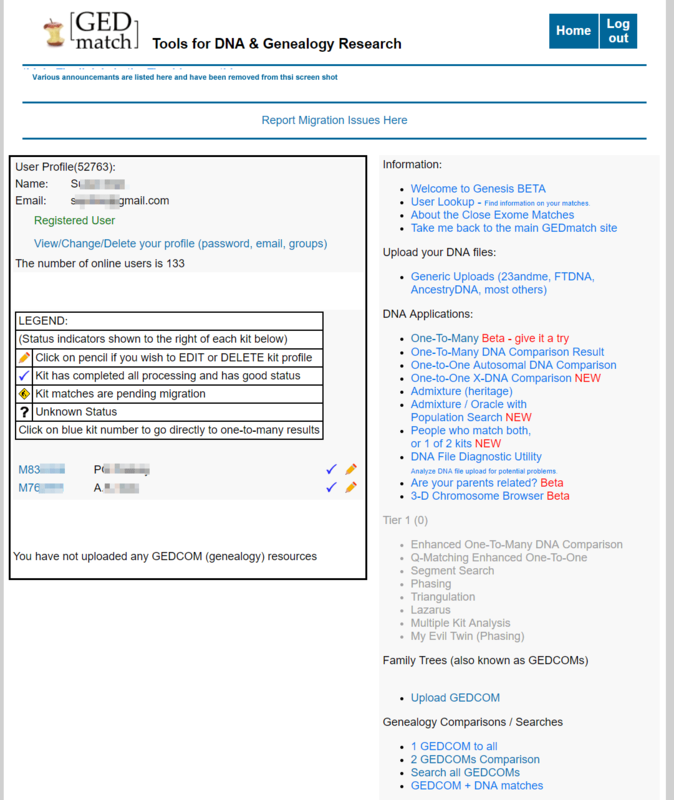 No place for notes on GENESIS but the beta one to many has the gedcom and wikitree links. I use the X chrome a lot. Is the one to many coming soon? I found this page because I’m looking for the “select” boxes to check off to “submit” in “People who match both kits, or 1 of 2 kits”, to compare chromosomes. They’re still on this gedmatch page, but not on the genesis version. Gedmatch has grown so large that they have gone to using cloud storage which is not free. So they have decided that in GENESIS all the multi kit analysis tools are for paid (tier 1) members only. That means the checkboxes. Since you can sign up for a month at a time this should not onerous. What does it mean when a kit number is highlighted green? Thx! I read your newest post and found out. Thanks! How can I get assistance from Gedmatch Genesis? I need to reupload DNA raw data, after deleting the original upload, but I’m not being allowed. Thank you in advance. There is a clickpoint at the bottom of every page that says Web site and contents ©Copyright 2010-2019 by GEDmatch®, Inc. – clicking the GEDmatch sends an email to gedmatch at gmail and oops it is missing on genesis!